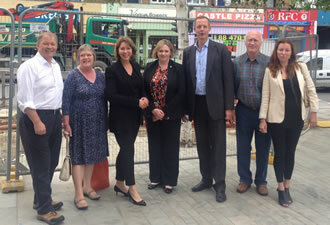 Local MP Mary Macleod welcomed the Planning Minister, Nick Boles, to Brentford and Chiswick last Friday. Eager to meet with businesses and residents to discuss their experiences of planning within the community, Mary took the Minister on a short tour of Brentford and Chiswick. Sitting in on Mary’s Business Forum at Chiswick Park, the Minister joined various local business leaders. Mr Boles opened the floor for questions from the businesses. The Minister also met with some of Mary’s residents in Brentford. Meeting at Time Café by the Grand Union Canal, Mr Boles heard from residents and local business owners about their hopes and frustrations over the redevelopment of the High Street. Speaking on the day, Nick Boles MP said: “Today has been a great experience. Talking to the businesses and residents in Mary’s constituency, I can clearly see local people are passionate about regeneration. Hopefully with collaboration between people and government, we can work together to overcome some obstacles which delay redevelopment, and we shall continue to see impressive regeneration in Brentford."